' Declare necessary class variables.
' this by attempting to open ports 1 through 4.
' place a check in the list box items that have openable ports.
' Check the box for available ports.
' Uncheck the box for unavailable ports.
' Enable the Find Modems button.
' This subroutine attempts to send an AT command to any active Comm Ports.
' Item is checked so it MIGHT be a valid port.
' 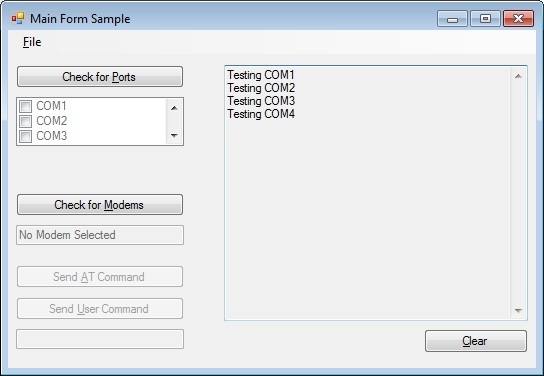 Check if port responds to an AT command.
' 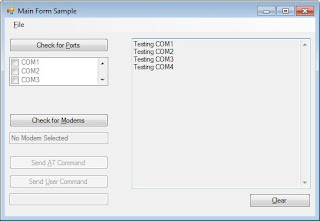 Set the class variables to the last modem found.
' Write message to the user.
' can interact with the modem.
' This subroutine clears the TextBox.
' This subroutine sends an AT command to the modem, and records its response.
' It depends on the timer to do the reading of the response.
' Always wrap up working with Comm Ports in exception handlers.
' Attempt to open the port.
' Write an AT Command to the Port.
' Sleep long enough for the modem to respond and the timer to fire.
' response. It depends on the timer to do the reading of the response.
' Write an user specified Command to the Port.
' is in the Comm Port buffer to the output window.
' Write the output to the screen.
' An exception is raised when there is no information to read.
' Don't do anything here, just let the exception go.
' be a modem. The function returns a Boolean.
' Sleep long enough for the modem to respond.
' Try to get info from the Comm Port.
' Port could not be opened or written to.
' availability a Try-Catch block is used.
' If it makes it to here, then the Comm Port is available.
' This subroutine writes a message to the txtStatus TextBox.
' the line feed to be suppressed.